Rosa Mercade joined Essity over a year and a half ago and has already had quite a career journey with Essity already in a relatively short period of time.Starting in February 2017 supporting the Retail Team, Rosa now manages her own teams and projects. 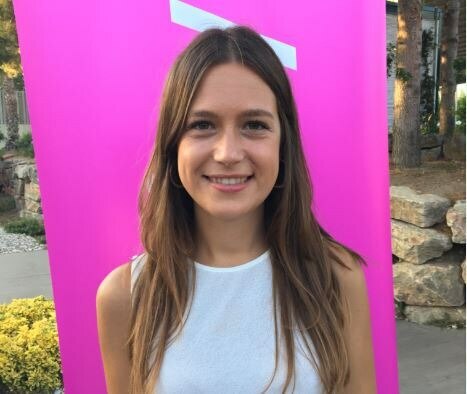 In the fast-paced and ever changing landscape of Retail, Rosa has to be both flexible and decisive in her role as Retail Brand Manager for Essity, Spain. She took some time to sit with us and tell us about her role and career journey with Essity so far. Hi Rosa, let’s start off with you telling us a bit about your role as a Retail Brand Manager. I am part of the Brand Team in the category of Consumer Tissue. When I applied for this position I didn’t truly understand how changeable my priorities would be from one day to the next. We deal directly with customers, who’s priorities and needs can shift very quickly in response to lots of different factors. You have to be light on your feet if you want to stay one step ahead of those changes. My team oversees all the topics related from the products we sell, to the service we give. We need to be really demanding of ourselves especially because we have a close relationship with our distributors and we want to always ensure that remains the same. I’ll give you an example of the kind of project I work on. The Families program is an Essity owned Shopper and Consumer Panel from which we can gather inputs, opinions and insights from our customers. A selection of 210 real Spanish families who are real consumers of ours. The program gives us regular feedback about our products and services through an online platform. I use this program a lot in my day to day job. As I mentioned we deal directly with customers and the Families program is a fantastic channel to do that. The honest and unfiltered input directly impacts how we conduct ourselves as a team and business and really influences decisions both I and my team make. It is definitely one of the most fulfilling and impactful aspects of my role. How would you describe the culture in your workplace? Working in the market we do, the role is not a calm or sterile experience but also not overly stressful. We have really clear objectives and my team works very closely together on a lot of projects. As I mentioned earlier, the priorities for both us and our customers can shift very quickly, so that sense of team work and collaboration is a great safety net to have. We have a lot of overlapping skill sets which I think complement each other nicely but we also have access to a great global network which helps with the bigger projects. As part of my role is centered around being a role model for my team, especially when it comes to things like beliefs and behaviors. As a manager you get a slightly different view of people’s way of working. We have really positive and forward-thinking values in Essity. I have had a really positive work experience so far as well as being able to build a strong bond with my team. I do feel a sense of culture fit, which for me I think is very important. It’s nice to see the company’s beliefs reflected in people’s attitudes and everyday working life. As a leader yourself – what qualities do you try to get your teams to champion? I always try to encourage collaboration and to have respect for each other’s strengths and weaknesses in my teams. We are all in this together, a lot of what we try and accomplish simply isn’t possible without input from many different areas of the business. Maintaining a core of respect and trust is vital for a productive and happy team. So, what do you think makes a good leader? A person who can trust their team, cares for them, enables them to succeed and keeps a clear head when things get busy. We work at a fast pace and things can go wrong, at those times you need somebody who can shoulder the burden and keep clear sight of the objective. You work with lots of different tools in your role, are there any innovations or technical solutions you are particularly excited about for 2018/19? Yes of course! I am very excited about all the new apps are setting up every day. I am particularly excited by FMCG and consumer changes using the online shopping, this segment is growing and changing rapidly, and the fast-paced nature of the online market really appeals to me. I think apps are going to revolutionize how we act as consumers. Your role sounds very full on, how do you relax/what do you do when you’re not working? I’m a chef! I like to experiment with cooking and socialize with my friends. I love trying out something new and finding an instant favorite, or not sometimes! I also like to do sport where I can, we have a great climate for outside sports in Valls. You have been with Essity over a very exiting period, what would you say to yourself a year ago now if you could? As you say Essity has undergone a huge journey itself in recent years but I have also had quite a journey myself, both personally and professionally. It’s been a really exciting experience so far but I would say the best advice for me would be: Be patient, real experience comes with time. I am part of some really impactful initiatives and the future is looking very interesting! If you could give anyone looking for a career at Essity some advice, what would it be? I would say: be prepared to work as a team and not individually. We do not work in isolation at Essity. Your team doesn’t stop at the edge of your desk, you have a network that is as global as it is local. It’s a lot to take in at first, but when you get used to the global culture it’s such a fantastic resource. And finally, Is there one thing you have done with Essity that really sticks in your mind? I know I mentioned it earlier but I really believe in The Families program. I just think it’s such a great project. I am lucky to be involved in it and I am very passionate about it as well as you an tell! I think it really has an impact on not just the business but also on those of us involved, it makes us much more aware of our customers’ needs and desires. If you could have a “super power” what would it be? Positivity! I am always looking for solutions not for problems. If you can’t go over the wall, go under or around it! Role model: Defintely my Great grand mother, she was brave and did all the things she wanted to. Most unusual place you have seen an Essity product and what was it? In a tiny village in Scotland, UK. There was a bathroom with different tissues from Essity, it was so strange to see it in such a remote place!